Millions of Israelis across the country were making their way to the polls on Tuesday to vote in the local municipal elections. Music blared from campaign tents outside designated voting stations with youngsters pushing flyers into people’s hands, holding posters and slogans, while saying “vote for so-and-so, he’ll be the best for the city,” as voters excitedly made their way into the polling stations. It was a family affair for many as parents pushed strollers, fathers carried their young children on their shoulders, with many allowing their children to put their votes into the ballot boxes. By 12 p.m., 760,335 voters had cast their ballots across the country. According to local election authorities, the national voting percentage stood at 11.54% excluding Jerusalem. 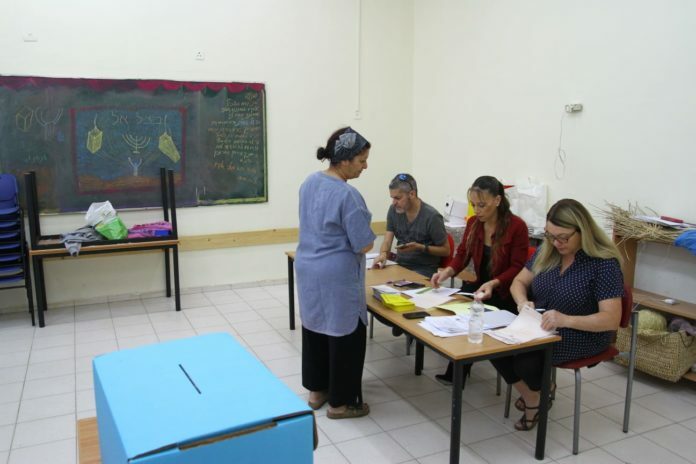 The voting rate in Tel Aviv at 7.75%; Rishon LeZion 10.28%; Haifa 10.28%; Petach Tikva 9.44%; Kiryat Shmona 12.82%. Numbers for Jerusalem were not yet available. Although disruptions were far and few, Israel Police reported that two people had been arrested for throwing tear gas towards a polling station near downtown Jerusalem, while riding on motorcycles. Police also reported that several scuffles had broken out at a polling station in Holon – where three people were arrested; in the northern town of Yarka where 10 people were injured after a stun grenade was thrown; and in Kfar Yasif, also located in the North. By the late morning, a number of high-profile politicians and mayoral candidates had voted including President Reuven Rivlin in Jerusalem, Justice Minister Ayelet Shaked in Tel Aviv, Sport and Culture Minister Miri Regev in Rosh HaAyin, Jerusalem Affairs Minister and Jerusalem mayoral candidate Zeev Elkin, Jerusalem mayoral candidate Ofer Berkovitch, as well as mayoral candidate for Tel Aviv Asaf Zamir and Tel Aviv Mayor Ron Huldai. Results for most towns and cities only be available on Wednesday morning, and the race in Jerusalem is expected to be close. Local election authorities explained that if neither candidate receives 40% of the vote, a run-off election between the top two will be held on November 13.